Made in New England: Avery's Totally Gross Soda - Unicorn Yack (Raspberry Orange Cream), 12 Fl Oz - Great White Elephant Gift! 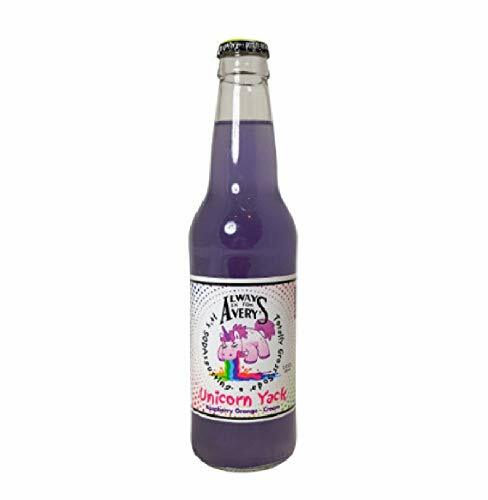 Avery's Totally Gross Soda - Unicorn Yack (Raspberry Orange Cream), 12 Fl Oz - Great White Elephant Gift! The Avery's line of sodas has been a central Connecticut favorite since 1904. Avery's sodas are still handcrafted using methods and recipes from generations ago including real cane sugar, the finest quality ingredients and naturally pure well water. Each flavor is carefully made in small batches and is packaged only in glass bottles to preserve the wonderful old-fashioned flavor.